The present Hastings United club was formed as Rock-a-Nore during a meeting in the London Trader in 1893; the club was made up mostly of fishermen and boatmen from the Old Town and used one of the pitches on the East Hill as their home. The club entered the Carlisle Cup for the 1893-94 season and finished third in a five team league. The 'Tanfrocks', as they were nicknamed, went on to win the 1894-95 Carlisle Cup, their second season in existence and went on to win the cup again in 1896 and 1897. In 1896, the club became founder members of the East Sussex Junior League, which soon changed its name to the Hastings, Eastbourne & District League, finishing runners-up to Rye for the 1896-97 season. Following another season in the District League, with a second team playing in the Carlisle Cup, the club were inactive for the 1899-1900, 1900-1901 seasons for reasons unknown, however they returned for the 1901-02 season and would go on to win the Carlisle Cup another three times between 1902 and 1904. In 1904 they entered the East Sussex League and were given permission to play matches at the newly constructed 'Sports Ground' sharing with St Leonards United. However their stay at the ground was short lived and they were back playing on the East Hill the following season. 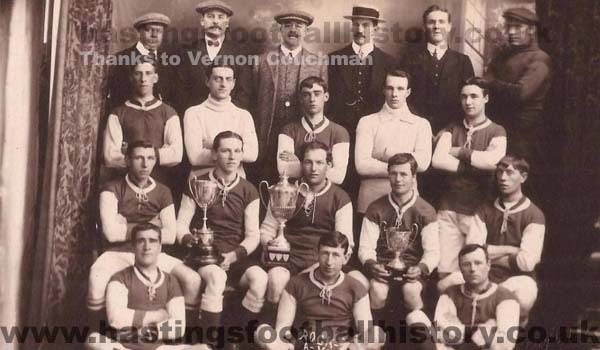 The club remained in the East Sussex League at least another four seasons, ending the 1907-08 season as champions, before leaving a returning to the Hastings & Eastbourne District League were they remained until the outbreak of World War One. Rock-a-Nore became founder members of the Sussex County League in 1920, whilst in the same year started playing home games at the Pilot Field. 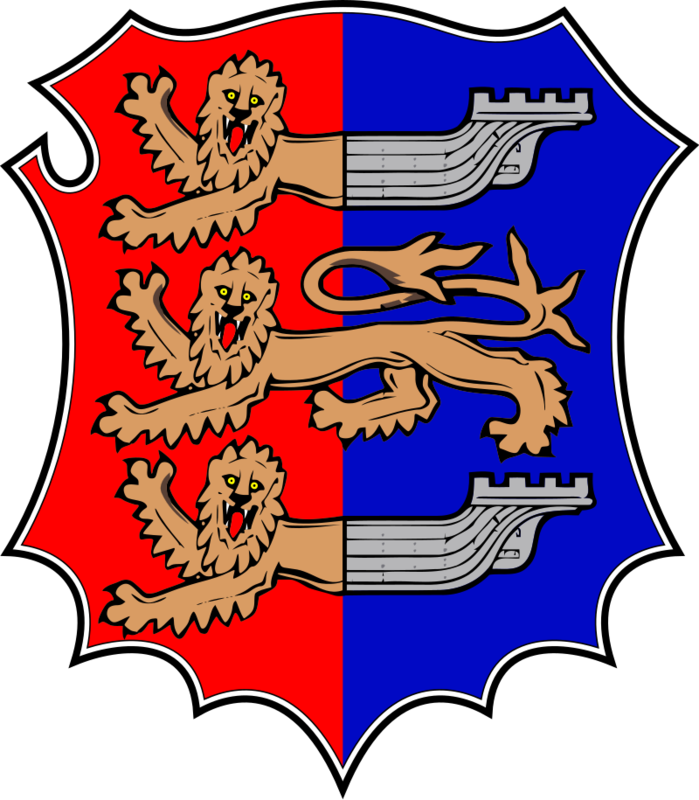 In April 1921, it was decided during a meeting to change the club name to Hastings & St Leonards Football Club, the reason being that including the town name would attract more support from around the town, also that every other club in the Sussex County League was named after the twon they were based in. Weeks after the name change a merger with All Saints FC was proposed, however All Saints, not wanting to lose thier identity insisted that their name be featured in the club name somewhere, something Hastings weren't willing to do and the proposal never materialised. However, the club were still able to attract a number of All Saints players for the 1921-22 season. In August 1921, Old Town United changed their name and took on the identity of Rock-a-Nore. The club remained in the County League for another six seasons, before leaving to join the Southern Amateur League in 1927. The Southern Amateur League was affiliated to the Amateur Football Alliance (AFA) and was based in the greater London area. 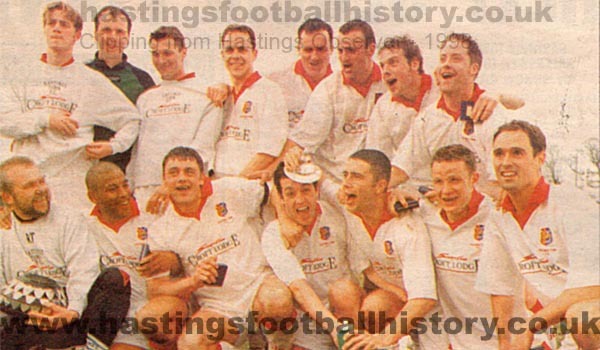 Hastings won division two in their first season and were promoted to division one, which featured Ipswich Town, Eastbourne and Carshalton. 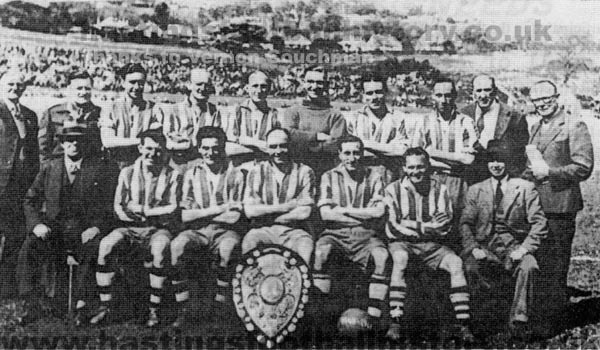 The club won the league three seasons in a row between 1935 to 1937, finishing as runners-up in the 1937-38 season, before winning the league again in the 1938-39 season. During this period the club also won the Sussex Senior Cup in 1935-36 and 1937-38 and the AFC Senior Cup in 1937-38. Hastings returned to the league after the second world war, finishing in second. However they left the league in 1946 to join the Corinthian League. 1948 saw the formation of Hastings United, which unfortunately for Hastings & St Leonards (also referred to at this point as Hastings Amateurs) meant they had to leave the Pilot Field. The amateurs could only offer a yearly rent of £500 against Uniteds' offer of £600 plus covering maintenance. The club club searched for an alternative venue, with the Central Ground being considered at one point, but were unsuccessful and had to withdraw from the Corinthian League after having only played one game. The club returned for the 1949-50 season, playing in the Hastings League, joining the East Sussex League the following season. By the now they were using the upper pitch at the Pilot Field, that would later become known as the Firs and in 1952 became founder members of Division Two of the Sussex County League, alongside Rye United and Hastings Rangers. The club initially struggled in the league, spending the 1950s and 1960s finishing no higher than mid-table, with the exception of a second place finish in 1959-60. The club changed name to Hastings Town in 1976 and would spend some time playing at Bulverhythe (presumably Hastings Rangers ground?) whilst they upgraded the pitch and clubhouse at the Firs. 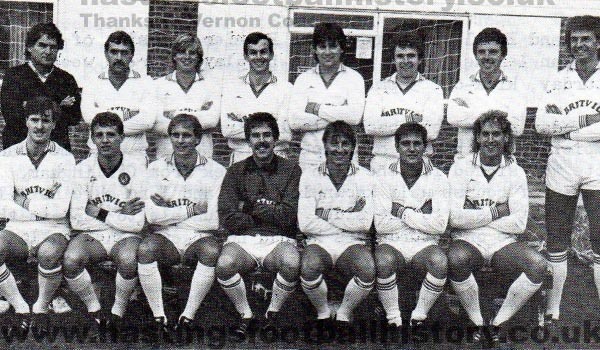 In 1979-80, they won Division Two, winning promotion to Division One where they remained until 1985. 1985 saw the demise of Hastings United, after years of debt finally caught up with the club. Hastings Town negotiated a long term lease of the Pilot Field with Hastings Borough Council and applied to take United's place in the Southern League. Town were successfulin negotiating the lease, however Witney Town, who'd avoided relegation due to United folding objected to the club being accepted straight into the Premier Division, so the club were placed in the Southern Division. The clubs ambition was to win promotion into the Southern Premier, but were only able to finish third, fourth and twelth in the following seasons. Peter Sillet took charge for the 1988-89 season and built up a side that eventually won promotition in 1991-92 as Southern Division Champions. The club saw further success winning the Southern League cup in 1995, beating Leek Town on aggregate and the Sussex Senior Cup in 1996 after beating rivals Crawley Town 1-0. Mark Gardiner, a local lottery winner previously involved with local rivals St Leonards Stamcroft, became chairman ahead of the 1997-98 season and made a generous playing budget available for manager Garry Wilson. However despite the strong squad assembled, the club languished around the bottom half of the table and Wilson was sacked following an FA Trophy loss to Bath City. Dean and Terry White took over and were able to steer the side to a fourteenth place finish and win the Sussex Senior Cup for the second time in three seasons. The following season, Town finished in fifht place, despite looking good on pitch the club were in trouble off of it. With Gardinder pulling out, the club found themselves in administration and were looking at the prospect of playing in the Sussex County League, having had their request to withdraw their resignation from the Southern League refused by the League, which had initially been made with the idea of joining the Isthmian League. A idea of Hastings and St Leonards merging had been proposed, but St Leonards weren't willing to do so, which led to a some ill feeling from Hastings fans whom felt the Saints had done so to take over Hastings as the biggest club in town, intensifying the rivalry. When it all seemed doomed a consortium led by Mick Maplesden, another local lottery winner, took over the club and with the finances looking better the Southern League allowed the club back into League, but into the Eastern Division. 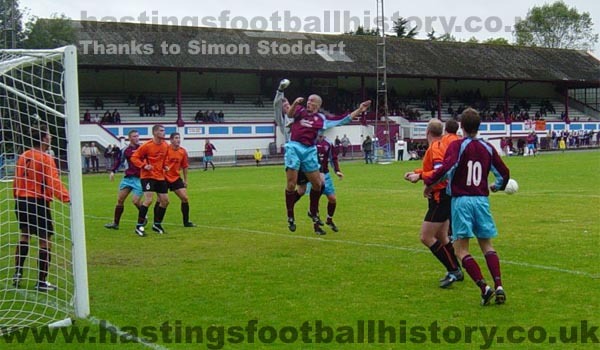 Following another two frustrating seasons of failing to win promotion back into the Premier Division, Hastings were successful in their third attempt, winning the league in 2001-02 two points ahead of nearest rivals Grantham Town. 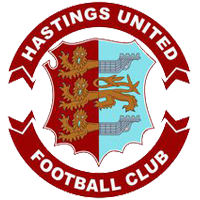 The summer of 2002 saw the club change name to Hastings United, taking on the identity of the club who'd folded in 1985. Now back in the Southern Premier, the club started strongly, reaching the first round of the FA Cup, including the 5-1 thrashing of Conference side Kettering Town and went onto lose 1-0 to Stevenage Borough at Broadhall Way. However, the teams form dipped dramtically and the club were relegated back to the Eastern Division for the 2003-04 season. That summer was to be one of massive changes, with the departure of George Wakeling as manager and nearly of the playing squad, a large chunk of which joining Eastbourne Borough and Folkestone Invicta; Dave Walters also took over as chairman with the task of finding a manager who can quickly put a side together capable of competing in the Southern League. Steve Lovell, former Crystal Palace, Millwall, Gillingham and one time Hastings Town player, was bought in as manager, who had little time to put together a squad of players. Bringing a large number of Gillingham youth team players, the club avoided relegation. The club were placed in Division One of the Isthmian League for the 2004-05 season, following the FA restructure of the non-league pyramid, however Lovell resinged in November 2004 and was replaced by former Wales and Everton goalkeeper, Neville Southall. Despite the club being in the top half of the table and looking good, Southall left midway through the 2005-06 season following talks with Dave Walters. Nigel Kane and Pat Brown took over and by the 2006-07 season Kane was in charge with brother Norman as his assistant. Hastings finished in the play-off spots that season and ended up beating Dover Athletic and Tooting & Mitcham United to win promotion the Isthmian League Premier Division. Kane would only last part of the way through the season, before departing after the club found themselves too close to the relegation zone, but were able to steer clear under the guidance of Tony Dolby and his assistant Mike Rutherford, after winning the last game of the season away to Leyton. However Dolby and Rutherford's sudden departure left the club managerless once more and John Lambert was promoted from reserve team manager, tasked with building a squad including replacements for several key players that had left that summer. Lambert built up a squad of mostly young local players and was doing well with the resources available to him and assistant Wayne Farrier, however he was suddenly sacked and Dolby and Rutherford returned to club. The management duo built a strong squad for the 2009-10 season and finished in seventh place, but departed once more after the season was over. This time it was Jason Hopkinson who was brought in as manager, who like Lambert used mostly young players, including some ex-Lewes Youth team players who Hopkinson had previously managed, but the team struggled in front of goal and Hopkinson departed after only a few months in charge. Hopkinson's replacement was Sean Ray, who was made player-manager. Ray would go on to lead the club to its best ever performance in the FA Cup where they would go onto reach the third round, losing to Middlsbrough at the Riverside Stadium. The second round tie at Harrogate Town ended 1-1 and the replay was played in front full capacity at the Pilot Field, televised live on ESPN Sport, where the club beat Harrogate on penalties. However, rather reminiscent of the 2002-03 season, the club struggled in the league and were relegated back to the Isthmian League South Division. Ray departed before the 2013-14 season and was replaced by former Crawley Town and Horsham boss John Maggs, but Maggs was another short lived appointment and was replaced by Terry White, who took the clubs to the play-offs where they would lose to Folkestone Invicta in the semi-final. White resigned the following season and was replaced by Dominic di Paolo, who only last two months, before being replaced by Nigel Kane. Dave Walters stepped down as chairman in April 2015 after selling his shares to Dave Ormerod. The new board appointed Garry Wilson as manager, with the ambition of winning promotion, however the club finished outside of the play-off places and Wilson resigned at the end of the season. Darren Hare took over for the 2016-17 season, with former Chelsea and Swansea City player Steve Watt as his assistant, the club finished in the play-off places but this time losing out to Dorking Wanderers. This season also saw Frannie Collin, former Gillingham, Dover and Maidstone striker, equal Terry White's record of scoring 32 goals in one season. However at the end of the season Hare resigned and former Brighton & Hove Albion player Adam Hinshelwood become manager ahead of the 2017-18 season.